The first settler of the city were the Subanon tribe along its riverbanks and was followed by the Muslims who settled on the coastal areas which is now the communities of Muricay, Tawagan Sur and was named “Tolpokan” meaning a place with abundant springs. Pagadian was first known as a sition of Margosatubig. On 1934, Director Teofisto Guingona Sr. was commissioned to find out the possibility of transferring the seat of governance of the Labangan municipality to another place. A conference was called together with the datus and the proposed transfer of Labangan government to Pagadian was greatly opposed by majority of the Christians. Later on the designated committee led by Datu Balimbingan and with the consent of Datu Macaumbang surveyed the western part of Pagadian and found Tolpokan as the final place for the transfer of Labangan government. At the same time Datu Macaumbang donated two hundred sixty hectares of land to Christians who were willing to transfer to Pagadian. With this recommendation on March 23, 1937 by virtue of Executive Order no. 77 of the late President Manuel L. Quezon created the Pagadian municipality. Then on June 6, 1952 by virtue of Republic Act No. 711, Zamboanga was divided into into two provinces: Zamboanga Del Sur and Zamboanga Del Norte. It was on September 17, 1952 when the Province of Zamboanga del Sur was formally approved and Pagadian became its capital town. Pagadian became a chartered city on June 21, 1969 by virtue of Republic Act No. 5478. Rural areas has a total population of 52,196 or 42%. Overall total population is approximately 125,182 as of the year 1995. Growth rate is said to be 3.75 persons per hectare or 375 persons per square kilometer. 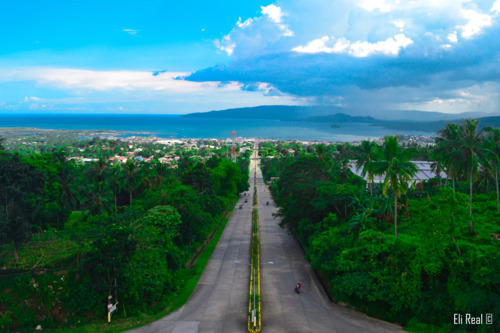 Pagadian City is consist of 333.8 km2 (128.9 sq mi) land area. About 45% of it is steeply sloping terrain of hills and mountains on the northwestern portion that covers an estimated 15,090 hectares. Mt. Palpalan, Mt. Timolan, Mt. Pinokis, and Mt. Sugar Loaf are the four tallest peaks. Areas in the direct north and central part, have gentle to moderate slopes, making up 47% of the total. The remaining 8% is level or nearly level which makes up most of the eastern and the southern parts of the city. The urban area covers about 845.48 hectares. Elevation of the urban area of the city ranges from 1 MSL near Pagadian Bay to about 100 MSL in the area of Barangay San Jose. Pagadian City products are seaweeds, coco processing, cassava; manufacture of furnitures and decors made out of wood, bamboo, rattan, steel and plastic; handicrafts made out of bamboo, rattan, coco shell, wood, marine shell, ceramics, and weaving. Bomba Beach – this is a 2 kilometer away from the city proper with the ambiance offering a perfect spot for fishing and swimming. Coral reefs can also be found here. Lourder Waterfalls – this is just 32 kilometers away from the city proper. The place is always visited by the tourists. Manga Falls – this is a two layered cascading falls surrounded by huge trees and a home to white monkeys.